Jockey Mark Enright (left) and Limerick hurler Shane Dowling (right). It's been a great couple of days for the county of Limerick. On Sunday their hurlers advanced to the All-Ireland hurling final for the first time since 2007 after a thrilling extra time victory over Cork, with substitute Shane Dowling leading the way with 1-4 off the bench to seal a memorable win. "When I grow up I want to be Shane Dowling"
Fast-forward three days and Enright was busy riding the unheralded Clarcam to glory in the Galway Plate at the Galway Races in Ballybrit, with the 33/1 outsider producing one of the shocks of the festival. 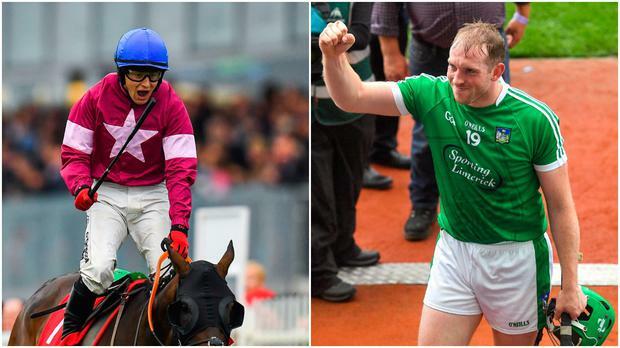 Following Enright's big win, Dowling took to social medai to return the favour, sending a brilliant tweet that encapsulates just how magical a few days it has been for Limerick sport.